In Sir Arthur Conan Doyle’s “The Adventure of the Silver Blaze,” Sherlock Holmes has a discussion with Detective Gregory from Scotland Yard about what witnesses recalled from a late-night murder scene. The whir of the world is complicated and we’re not always as successful at observing as Sherlock Holmes. Our eyes don’t see everything that is happening, and our minds don’t evaluate every possible option in decision making. Sometimes we discover our choices have not been optimal. When we realize this, does it become a beacon to better decision making? Or do we revert to denial and quickly file it in the “that never happens to me” cabinet in our brain? Behavioral sciences can help us make better decisions by highlighting (or lowlighting) certain options among the choices we have. Framing, anchoring, social proof and choice architecture are but a few of the tools at play. In various ways they can, in effect, help us to pay attention to the dog that didn’t bark. For good anthropological reasons, we focus on what is in motion, not on what is at rest; we focus on the effect we’re trying to get instead of the circumstances that cause them; we rely on identifying obvious changes and miss the subtle changes. Work by Dan Simons, PhD at the University of Illinois, and Christopher Chabris, PhD at Harvard University illustrates through a host of experiments that our eyes see but our brains don’t acknowledge everything happening in front of us. Is there a corollary here with decision making? Do our minds evaluate everything that is relevant to making a decision or do we take shortcuts and parse through the obvious? Now that you’ve seen the video, did you see the gorilla (or if you’d seen similar videos before, did you see it the first time you watched the video)? If you saw the gorilla – that’s great. If you didn’t see the gorilla – that’s fine, too. Roughly 60% of first-time viewers don’t see the gorilla. Please remember this: when we don’t see the gorilla, it doesn’t mean it wasn’t there. But that’s not all. Did you see the change in the background color of the curtain, or how one of the black-shirted dribblers left the scene? The real world is more complex than a 40-second video with 6 people dribbling 2 basketballs. We simply can’t take in and process everything we see. Nor can we consider every relevant option in every decision. That’s where behavioral sciences can help. What Can Behavioral Science Do for Me? Schlomo Benartzi, PhD, is a researcher at the University of Southern California, Los Angeles. He and group of colleagues set out to learn how results of traditional economic interventions compared with behavioral interventions in various situations. What they discovered was powerful. Figure 1: "Should the Government Invest More in Nudging?" Benartzi, et. al 2016. Researchers compared different attempts to get low-income high-school students to apply to colleges. It is widely accepted that low-income students are under-represented in colleges, even though financial subsidies are available to make it affordable. The question faced by many institutions is “how can we get more applicants?” In many cases, federal and state agencies are trying to help. The federal government’s big intervention comes in the form of tax credits to offset the cost of college for low-income families. But the investment in the program has yielded virtually no impact on enrollment, as can be seen in Figure 1. State governments stepped in to up the game, but state subsidies were only able to get about 5/1000th of a student per $1,000 spent. (That means to get one student enrolled, the government would spend close to $200,000.) The results increased with the use of monthly stipends aimed directly at the low-income students and enrollments increased to about 3/100th of a student for every $1,000 spent (or about $33,000 per student). The most cost-effective tool, it turns out, is counter-intuitive and is noted in the yellow-blue striped bar at the top of Figure 1. The best way to get low-income students to apply and enroll is a meeting with tax professionals to help families fill out college financial aid forms properly. This nudge gets about 1.5 low-income students enrolled for every $1,000 invested. One of the underlying issues is that when the only interventions available were financial, the return on the government’s investment was extremely low. Now that an alternative, more behaviorally-focused option has been explored and proven more successful, tax-payer funds can be used more effectively at helping low-income students enroll in colleges. Figure 2: "Should the Government Invest More in Nudging?" Benartzi, et. al. 20216. 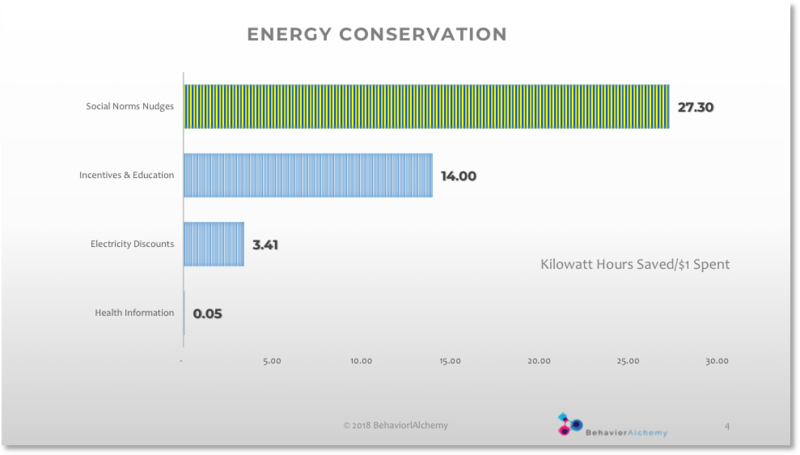 When it comes to energy usage, we are heavily influenced by our peer group. In Figure 2, energy users who were reminded of how much they are consuming compared to their neighbors led to saving 27.3 kWh per billing cycle. This savings was nearly double the rate saved when financial incentives and education were included (still good at 14 kWh/billing cycle) and eight times better than offering discounts. When monthly energy bills with social comparison were first put in place by companies like OPower in the early 2000’s, the residents believed it had no impact on them. Yet, it made a measurable impact on nearly everyone getting those bills. The impact on energy usage was nearly 100% unconscious. Over time, the social-proof model has become the norm among energy providers, but until it was tested, the idea was brushed aside. Figure 3: "Should Government Invest More in Nudging?" Benartzi, et. al. 2016.